When I saw this in a 1956 issue of Woman's Home Companion I just knew I had to share it with you all. Isn't it darling? 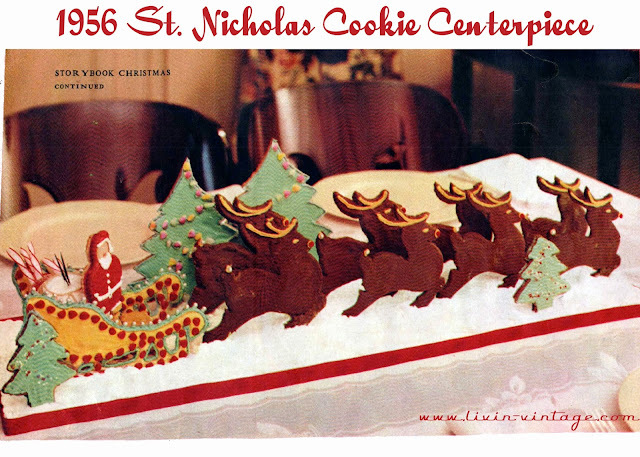 The article suggests cutting out the templets and tracing them on cardboard to make it more stable when cutting the designs out around the cookie dough with a knife. While there was only the sleigh and reindeer templets provided, tree and santa cookie cutters are fairly easy to come across. Actually, I am willing to bet that all these cookie cutters could be sourced, eliminating the need to use the templet. If anyone makes one of these, I would love to see it! Comment with a link to your photo and if I get enough, I will share them all in a future post. Speaking from quite a bit of experience with templates for cookies, there are a few things that will make it go easier. 1. If possible, print off (or draw) the details from the original source, and affix it to the template. This will save you time trying to locate the original picture when it comes time to decorate. If you lack a colour printer, note the colours needed on the various sections of the template. 2. Use a good quality cardstock. Cardboard will absorb the butter from the dough, and you won't want to keep it in a file for future use. You can also tape some wax paper on the opposite side. 3. Use a sharp knife, and cold dough. The warmer dough gets, the harder it is to cut a clean line with a knife and a template. If need be, roll the dough out on a flexible cutting board, and return it to the fridge before cutting. 4. Make extra, because there will be breakage. The baker gets to eat the mistakes, so all is not lost. Good luck. I hope you get some pictures to post. I'd do it myself it I weren't already looking at hundreds of cookies over the next couple weeks. Wouldn't that be WONDERFUL! Sadly i have not the time of the patients (with baking) I could provably make it out of wood and paint it though!